Thanks for taking the time to read our review of the Black and Decker 36 Volt Strimmer with the model number GLC3630L20-GB. This is a cordless strimmer with a powerful 36V battery. Simply because of the great reviews, we have made this number one on our list of cordless trimmers,It is not a cheap choice and the average price is around £135, with an RRP of £170. This is for the strimmer and battery. You can also get this one with a spool and line bundle for a few extra pounds. If you want an extra battery, that option is also available, and it will cost an extra £55 to have that option.This strimmer is well designed and very powerful for a battery style trimmer. Buyers who bought this use it for a number of grass cutting activities and also for creating neat edges on their lawns and gardens. 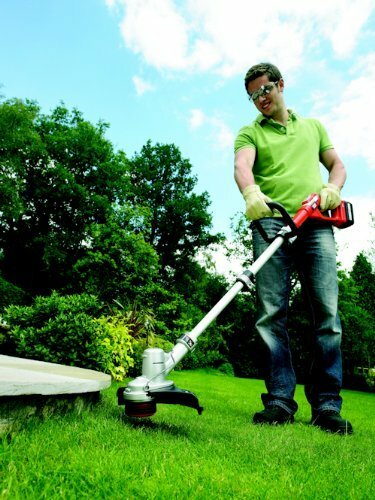 How Buyers Rate the Strimmer? It is always worth reading about the specification as that is the best way of knowing exactly what you are getting. It also helps you decide if this is the right choice for your own specific needs. Uses a high torque gear system to deal with even the tallest of grass, or the toughest of weeds. According to the manufacturer, Black and Decker, with one fully charged battery, you can cut up to 3750 linear metres.That is impressive and sets this one at the top of the pile for a longer lasting battery. There are plenty of contented gardeners who own this product and it has a 90% satisfaction rating. This product sells more than any other product online when it comes to buying a cordless strimmer. However is these are not the ones for you, then check our top rated list here. These have a high-torque gear system, and that really helps power through the toughest of any over grown area. The battery life is excellent. It has a 30 cm cutting swathe, and that makes it an excellent choice for larger gardens.